I look forward to every season, but Autumn is my favorite. The air is crisp, the leaves are crunchy and the humidity is crushed by the cool Autumn breeze. I also look forward to planning our fall garden. 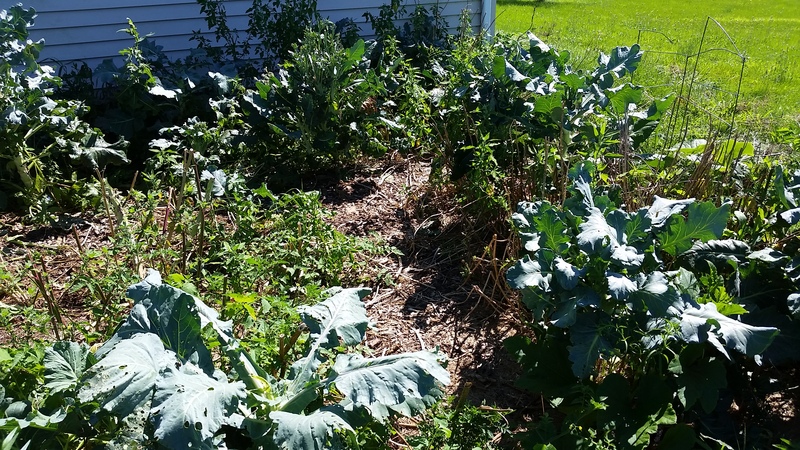 Last year we planted a TON of vegetables without much success. This year, I think we will only plant broccoli, brussel sprouts, cabbage, carrots and garlic. I’ll probably throw down some beans and lettuce as well, but I’m not going to stress about getting everything in the ground according to “the schedule”. To prepare for the beds, we are clearing out the brassica area of the kitchen garden. The broccoli left has either gone to seed or been eaten by my little broccoli monsters. Joe is enjoying the destruction of the broccoli, cabbage, weeds and borage. 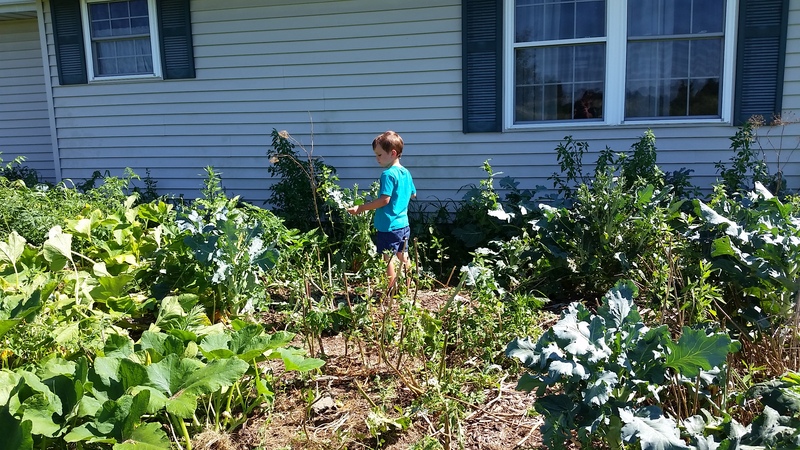 He flits from plant to plant, pulling leaves, stems and roots with the abandon and energy only a 4-year-old can muster. Around the first week in August we’ll start to direct sow lettuce and beans. We’ll also start our brassicas – broccoli, brussel sprouts and cabbage – indoors as it is too warm for these cold loving plants. A few weeks after that, we’ll direct sow carrots and more beans. If it is cool, we’ll start to set our brassica seedlings outside for a few hours a day. We’ll continue to sow lettuce and spinach every couple of weeks so we’ll have a constant supply. Finally, when the first frost hits, we’ll plant garlic and shallots all over the place. Our fall garden wasn’t great last year. I ran out of steam, got lazy and took naps instead of planting. This year, I’m not going to put too much stress on what we are planting and when we need to plant it. I’m prepping the beds, throwing down the seeds and letting Mother Nature take over. She does a pretty good job. 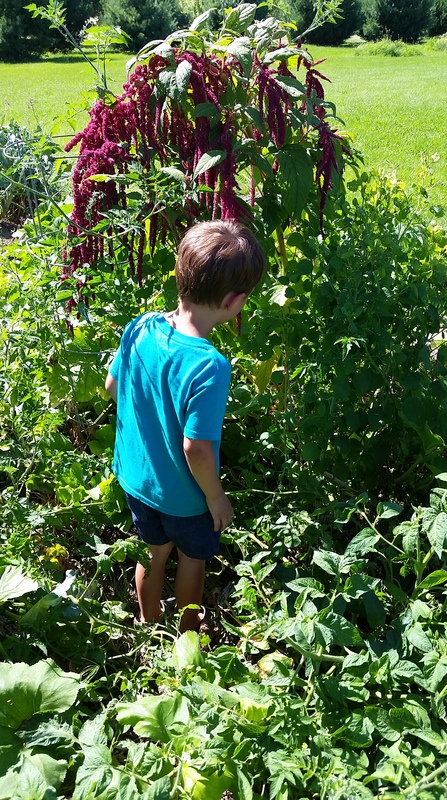 This entry was posted in Chickens!, For the Kids, Garden Stories, Life, Permaculture, Preparedness, Writing. Bookmark the permalink.